Courses are held from September to April, this is perfect time for all the Spring flowers are available and running into the Summer when so many more varieties are available. Our price includes private tuition in a class of only 2-4 max. all flowers, foliage, vases, containers, florist sundries and materials; and printed Commercial Floristry Notes are provided. 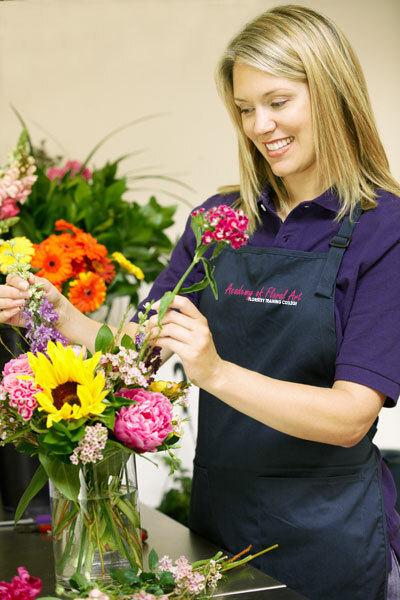 Our Intensive Commercial Floristry or/and Wedding Specialist Courses are 100% practical flower arranging, with one-to-one,”hands-on” training. During our Intensive Commercial Floristry or/and Wedding Specialist Courses you will complete 40-45 designs and in Wedding Specialist approx. 30. All flower designs are taken home with you after classes. We guarantee you will have the same teacher for your entire course. You may choose a 3 days x 3 weeks or 2 days x 4 weeks. (see Timetable under Intensive Course). Class times are 11 a.m. to 3.40 p.m. 2 classes & 40 min lunch break. Please note: parking is available within the grounds of the Academy. Certificate choices are: Commercial Floristry, Wedding Specialist or Bridal/Bridesmaid’s Bouquets, i.e. fully-wired Bouquets and stemmed Bouquets. Call now to reserve your place in one of our exciting and informative Courses. Call us for next available dates if not listed on the timetable to suit you.